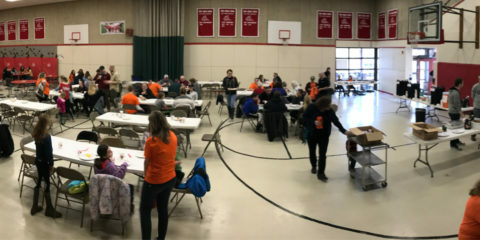 In February, JMG helped sponsor the annual China Family Fun Day at the China Conference Center. 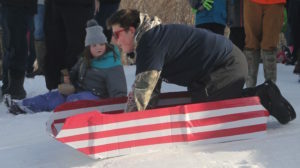 Participants enjoyed an afternoon of sliding, a cardboard sled race and food providing by Big G’s Restaurant. 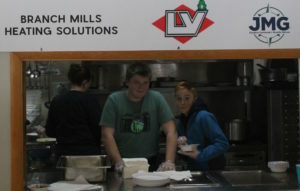 Pictured are Lukas Finley and Kyle Burrill, who helped with food service. And Lukas on his cardboard sled. 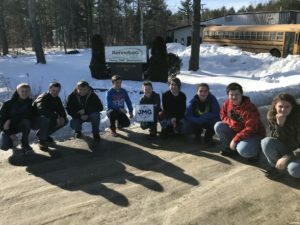 I took advantage of the opportunity to visit Kennebec Technologies (KT) in Augusta, a precision machine shop, and I definitely enjoyed my experience. I learned that KT is very detailed oriented in all aspects of their business. Customers expect perfection and KT does everything to provide that. For example, they have quality engineers and labs that inspect and ensure that all precision parts and products will meet their customers’ satisfaction. 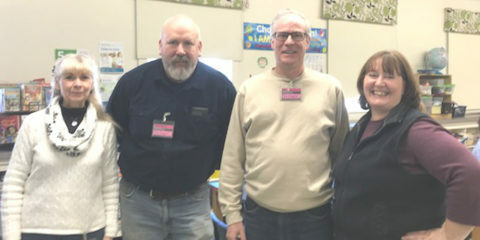 When a customer is not satisfied KT works as a team to create a solution that will improve the quality of the product. Through my experience, I was reminded of the importance of having a positive mindset, which helps maximize efficiency and production. Paying close attention to the details is important in my everyday life and will help me be a better and more successful person. 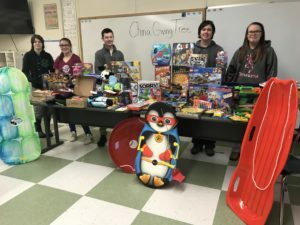 CMS JMG in partnership with the China Town Office collected gifts for local families. 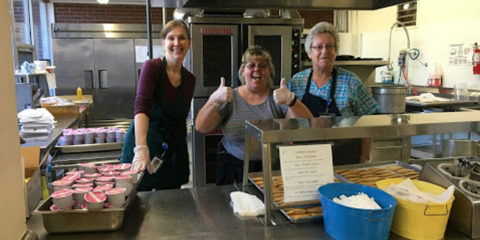 Thank you CMS and CPS communities for the outpouring of support! 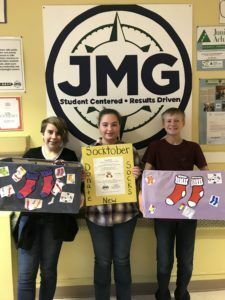 CMS JMG in partnership with the China branch of Bar Harbor Bank and Trust collected 176 pairs of new socks for the Maine Children’s Home during the Socktober campaign, spanning the month of October. 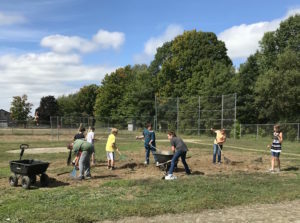 Students in JMG help clean up the athletic fields. 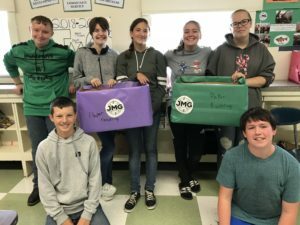 Jobs for Maine Graduates (JMG) partners with public education and private businesses to offer results-driven solutions to ensure all Maine students graduate, attain post-secondary credentials and pursue meaningful careers. 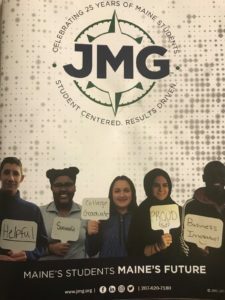 JMG is a collaborator with each of its strategic partners and partnering schools, tailoring its role to support individual curriculum, cultures, and offerings by filling voids and gaps that existing resources can’t meet. All work together in moving students forward and celebrating shared achievements. 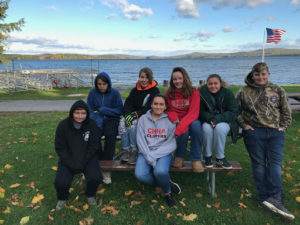 JMG is the only nonprofit in Maine offering a continuum of support to help students transition from middle school through high school graduation, on to post-secondary education, through degree attainment and connections to successful career pathways. 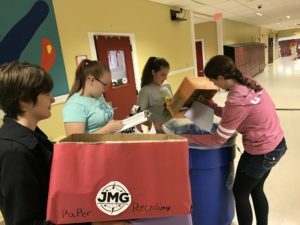 If you would like more information about participating in JMG please contact Ryan Sweeney at rsweeney@jmg.org or 445-1500.